Highest Rated Bus Tour in New York! Get TicketsWait! There’s more! Free bottled water is OnBoard during the tour. Our shuttle buses are climate controlled, so they’re cool in summer and warm in winter. The shuttle waits for you at each attraction so you don’t have to stand around waiting for the next empty bus. These are just a few of the reasons to take an OnBoard Tour Today! Why is it so great? Tour Guide Will Hop Off The Bus With You At Each Stop. See why this is so important by clicking here. 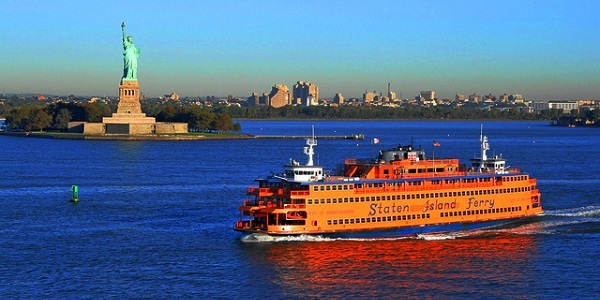 BEST VALUE: See the Statue of Liberty up close from the Staten Island Ferry and avoid the long lines at Ellis Island. We guarantee you’ll not only save time, but get better pictures of Lady Liberty! Ready to book? We guarantee you’ll be glad you chose OnBoard Tours for your NYC visit. You can conveniently book now online (by hitting the big red button) or call us at: 212-852-4821. Flexible Tickets Refund Policy: In an effort to keep our prices low all sales are final. If you’re uncertain of your travel plans and feel they might unexpectedly change, please purchase our optional Tour Insurance.